When it comes to fashion advice, I’m (not) the person you want to talk to. I hate to brag, but I’ve been the most fashionable dresser since my first birthday party. It’s true. While everyone else was wearing blue jeans and neon windbreakers, I was breaking boundaries and wearing birthday cake and frosting. You should have seen their faces. Their jaws dropped and their eyes widened, completely amazed by the newest trend that I had come up with. Some even looked at themselves in disgust and shame. Nowadays, wearing food is so last year (am I right, Lady Gaga?). The newest winter trends are on the rise and your humble fashion guru will gladly let you in on the latest and greatest garbs. With these five fashion tips, you are sure to win the Best Dressed award at your next office Christmas party. Isn’t it ironic? Suddenly the worst thing to wear is now the best thing to wear. These are starting to catch on more and more but for all the wrong reasons. Some people think it’s “funny” to wear an ugly sweater. Well let me tell you, there is nothing funny about true, respectable fashion. 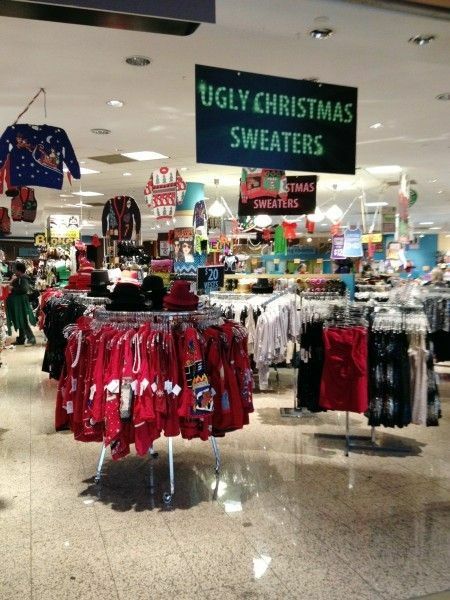 People have the wrong idea about ugly sweaters. These are not supposed to be worn for just special occasions or those dreadful ugly sweater parties. They are to be worn daily and with pride. Don’t let anyone tell you differently. Nothing says “take me” like a large, hooded coat lined with fur that drops just above the thighs. These warm garments were made by Caribou Inuits, who only knew two things in life: surviving harsh winters and looking flippin’ fabulous. If that hasn’t convinced you of parkas’ sexiness, then perhaps the shree-shree-shree sound it makes while you walk might change your mind. Who says old aviators were the only ones who could wear those hats? You’ve seen them before. They are those enormous hats with the big, fluffy flaps. Some of them even have flaps on top of the flaps. That’s so fashionable. I wish I had thought of it. What’s great about these caps is that they cover your entire head and most of your face. And who wants to look at that before the holidays? That’s what people will ask you when you’re sporting a pair of camouflage boots. These trendy little loafers do more than keep your feet warm, they let people know not to mess with you. Nobody messes with someone who wears camouflage boots. Why? Well those people will most likely assume that the shoes are steel-toed or they’re completely petrified by a person with no feet appearing to levitate before their very eyes. So the next time you’re out shopping and you’re worried about being pestered by salespeople from Buckle, just remember to lace up those camouflage boots. You will be safe. Fashionably safe. Long johns aka long underwear. Don’t let the name trick you, these are clearly to wear on the outside for the whole world to see. They’re surprising fashionable with its one solid color, elastic waistband and handy front pocket. To look even more fashionable, I suggest tucking your long johns into your long socks. The colors don’t have to match, of course. Every color goes well with long johns.